We provide HVAC heating & cooling services for Livonia MI (zip codes:48150 48151 48152 48153 48154). New air conditioner, furnace replacement and repair, air conditioning sales and service for Livonia MI. We here at Proficient Heating and Cooling are a family owned and operated business based in Livonia MI. We have been installing, servicing and repairing furnaces and air conditioning units for over 20 years in Livonia MI. We specialize in residential and commercial heating and cooling system installation and repair. Our team of certified, factory trained experts are qualified to assist you with the sale, service or installation of the best system suited to your home or business. Being based in Livonia MI we can give exceptional, quick and reliable service to the Livonia MI area. 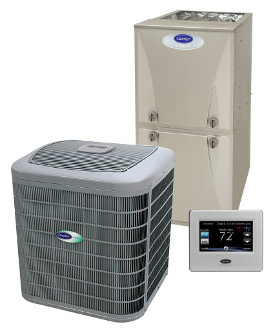 You can save money with a new high efficiency air conditioner or high efficiency furnace! Some older air conditioners and furnaces in Livonia MI are not energy efficient and will just waste money. Whether you need a new air conditioner or just need your old air conditioning unit repaired, we can do the job for you. We can install a central air conditioner unit or a thermostat. No job is too big or too small for our loyal Livonia MI customers. We offer free installation estimates, quick response times and personalized friendly service for our clientelle in Livoina MI. We at Proficient Heating and Cooling bring you over twenty years of HVAC experience satisfying customer needs in the Livonia MI area. We work hard to make your experience with us more than just average. Our customers receive nothing less than excellence! With over eighty-five percent of the jobs we receive in Livonia MI coming from referrals, we can confidently stand behind our services and professionals. One-Hundred Percent Customer Satisfaction in Livonia MI is always our #1 Goal!